The Stone Malone Gallery in Hollywood is running a timely art show before the California Primary on June 7th, featuring some of L.A.’s top street artists, including Shepard Fairey, Teachr, Free Humanity, Lydia Emily, The PSA Crew, and more. 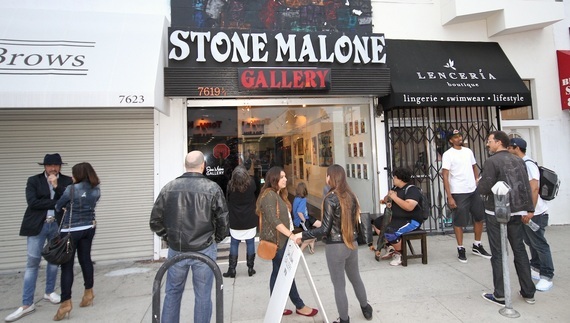 The art show, “Where Else But The Streets,” runs through Saturday June 4th at Stone Malone Art Gallery on 7619 1/2 Melrose Ave. When the show opened this weekend, sticker fans lined up for the gift bags of exclusive collectors sticker gift bags for the first fifteen in line. The art opening was also a book release party for the new photo book Where Else But The Streets: A Street Art Dossier, which features Shepard Fairey, Banksy, Mr. Brainwash, Teachr, Free Humanity, Lydia Emily, and other L.A. political street artists. 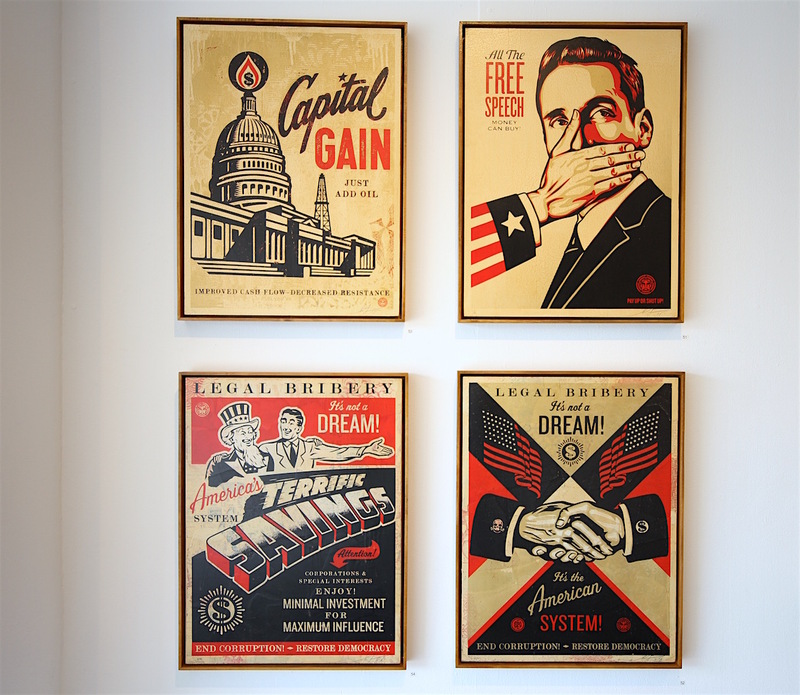 Shepard Fairey exhibited new works along the theme of campaign finance reform. 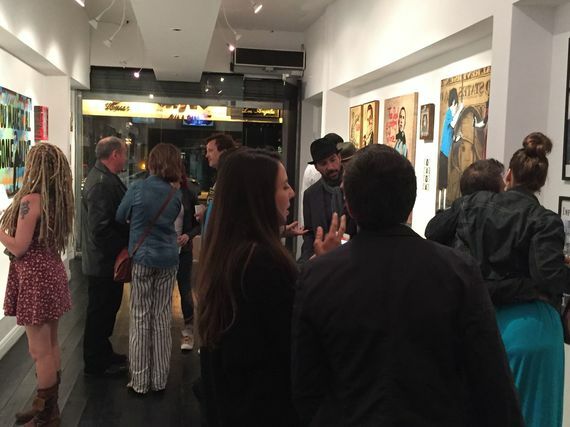 This art show originated through the film PAY 2 PLAY: Democracy’s High Stakes, about how outsiders are fighting to get money out of politics. Street art is used in the film as a metaphor for taking to the streets to use your voice. This piece by Free Humanity, “LandObama,” cites Lando Calrissian’s infamous realization over President Obama’s visage. This was originally on the streets just before Bin Laden was killed, at a time when Obama’s mojo was at an all-time low. This art appears in the film PAY 2 PLAY as well as the book Where Else But The Streets. 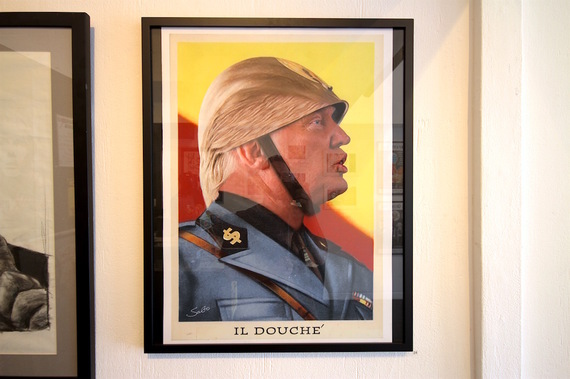 Even the right-wing street artist Sabo shares a distaste for Donald Trump. 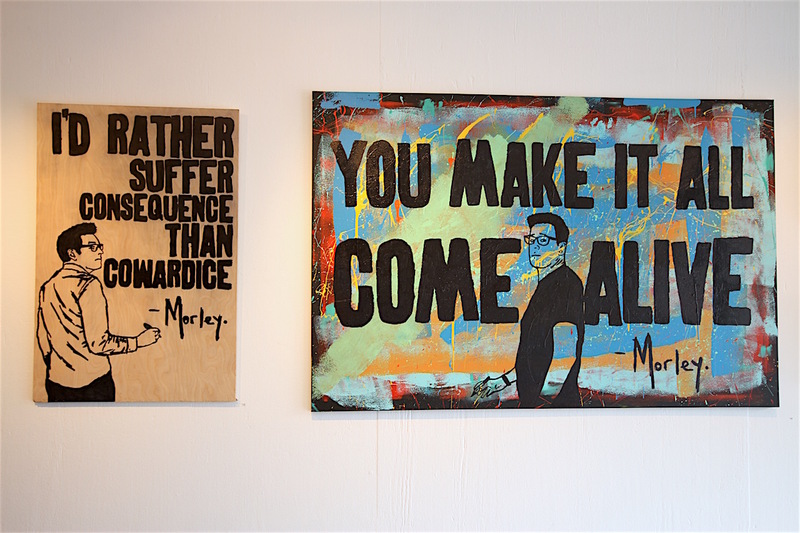 Self-effacing street artist Morley is known at the Stone Malone Gallery as a popular favorite. 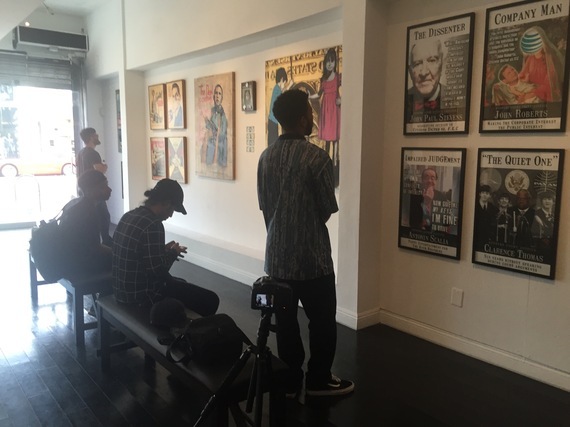 Activist Comics, a street series from The PSA Crew, were displayed on canvas for the first time. Archival prints of photos from the book are also on display. This picture of Alec Monopoly painting Jack Nicholson in lakers colors overlooks the Hollywood Walk of Fame. 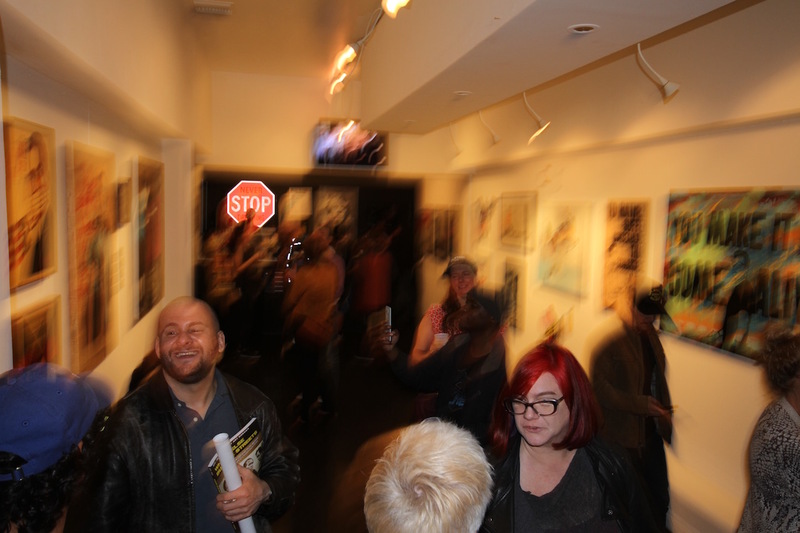 It was quite a happening turnout throughout the night, with music provided by Proper Propaganda of Radio Free Brooklyn. The Stamp Stampede was represented at the show, where partygoers could use their money as speech by stamping “NOT 2 B USED 4 BRIBING POLITICIANS” and spreading a message like street art does. During daytime hours of the show, these high schoolers were overheard discussing what the Supreme Court artwork meant, with one fellow telling his friends who the Koch Brothers and Clarence Thomas are. As you (hopefully) know, California’s June primary is just days away—and the good people at Hollywood’s Stone Malone Gallery decided to commemorate the upcoming election with a limited-run political art show. “Where Else But The Streets,” which opened Saturday and will run until June 7, features art from Shepard Fairey, Teachr, Free Humanity, Lydia Emily, Plastic Jesus, Morley, All The Girls Love Earl, Toolz, Sabo, The PSA Crew, among others. 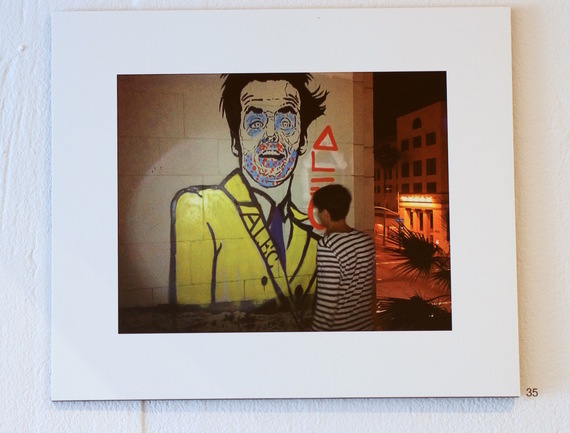 The exhibit runs in conjunction with a new photo journal from Rothco Press called Where Else But The Streets: A Street Art Dossier. We spoke with gallery director Quentin D. Moses and John Wellington Ennis, who put together the book, about the exhibit, and we are excited to feature an exclusive peek at the work in the show. 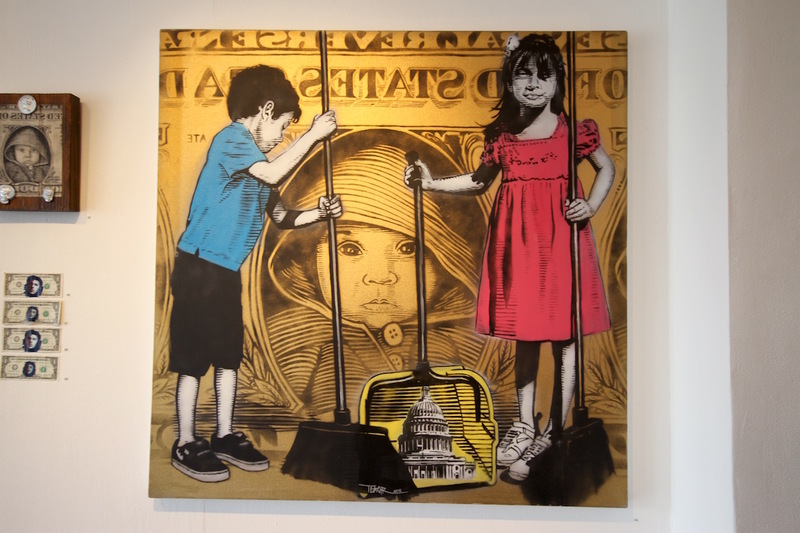 Our preview features work by Shepard Fairey, Teachr, Morley and Sabo. 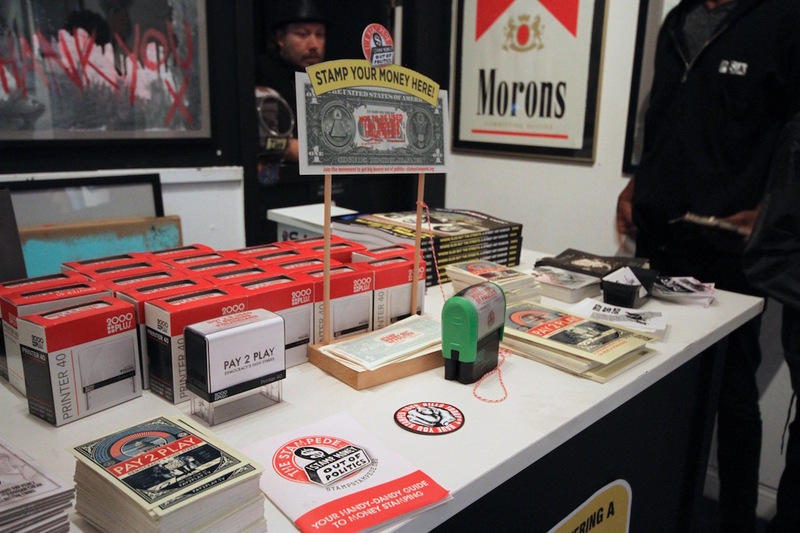 The Shepard Fairey images were released as limited edition lithographs earlier this year through Shepard’sObeyGiant.com. According to Ennis, Fairey has been a long proponent of campaign finance reform, The four pieces here are part of a limited series handmade on Obey’s stylized canvas made from his distinct background material of combined images wrapped onto a wooden backing with multi-layer screen prints. Ennis told us that the exhibit itself came about in an unlikely journey from his 2014 documentary Pay 2 Play, which looked at money in politics. As he and his team looked for ways to visualize how individuals were protesting corporate money in the campaign finance system, they started looking at the work being done by street artists. Those interviews ultimately led to the book. According to Moses, artists will also be creating new pieces on the walls around the Melrose gallery. 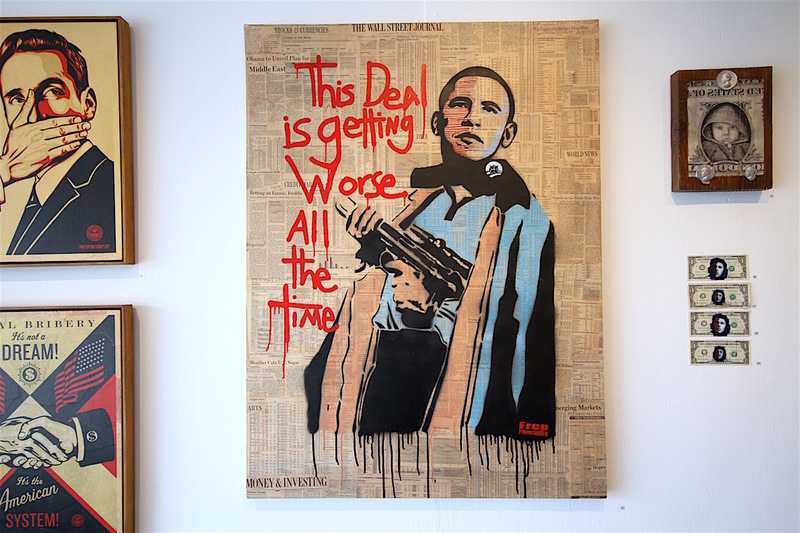 “From 2010 to 2012, there was an explosion of street art in L.A.,” Ennis said, saying that the boom stemmed in part from the release of Exit Through the Gift Shop and Banksy’s 2011 visit to L.A. for the Oscars, and then stretched through the Occupy Wall Street movement into early 2012. “Where Else But The Streets,” runs until June 7 at Stone Malone Gallery on 7619 1/2 Melrose Ave., LA, CA 90046. The gallery is open Tuesday through Saturday from 2 p.m. to 10 p.m., and Sunday from 2 p.m. to 7 p.m.
Order WHERE ELSE BUT THE STREETS: A Street Art Dossier, as a 158 page photo book or download the ebook! See PAY 2 PLAY: Democracy’s High Stakes, the documentary that became a movement and inspired this book about Los Angeles street artists. For more great books on art and counterculture, check out Rothco Press.